Each of the 22 Arab League member states is now free to offer military aid to the Free Syrian Army (FSA) fighting forces loyal to President Bashar al-Assad. The 22-member bloc also wants the Syrian National Coalition of Revolutionary and Opposition Forces “to form an executive body to take up Syria’s [Arab League] seat” and represent Syria at the impending Arab summit in about three weeks. The league suspended Syria's membership in November 2011 after the Assad regime failed to abide by an Arab peace plan that sought to end the conflict. 1. To reaffirm recognition of the Syrian National Coalition of Revolutionary and Opposition Forces as the sole representative of the Syrian people and the chief interlocutor with the League of Arab States. 2. To invite the Syrian National Coalition of Revolutionary and Opposition Forces to form an executive body to take up Syria’s seat at the Arab League, plus its organizations, councils and branches, and to participate in the upcoming two-day Arab League summit to be held in Doha on March 26-27. That will be the case until an elected government assumes office in Syria. This [decision] is in recognition of the Syrian people’s sacrifices and extraordinary circumstances. 3. To reaffirm continuation of the quest for a political solution to the Syrian crisis and to uphold the right of individual member states to offer, as they choose, all means of self-defense -- including military – to prop up the steadfastness of the Syrian people and Free Syrian Army. 4. To convene an international conference at the UN for rebuilding Syria. The resolution carried three footnotes. One said Algeria expressed a reservation on the second article. Another said Iraq took issue with the second and third articles. The last said Lebanon “dissociated” itself from the resolution altogether. Algeria, Iraq and Lebanon were represented at the meeting by their respective foreign ministers – namely Mourad Medelci, Hoshiar Zebari and Adnan Mansour. 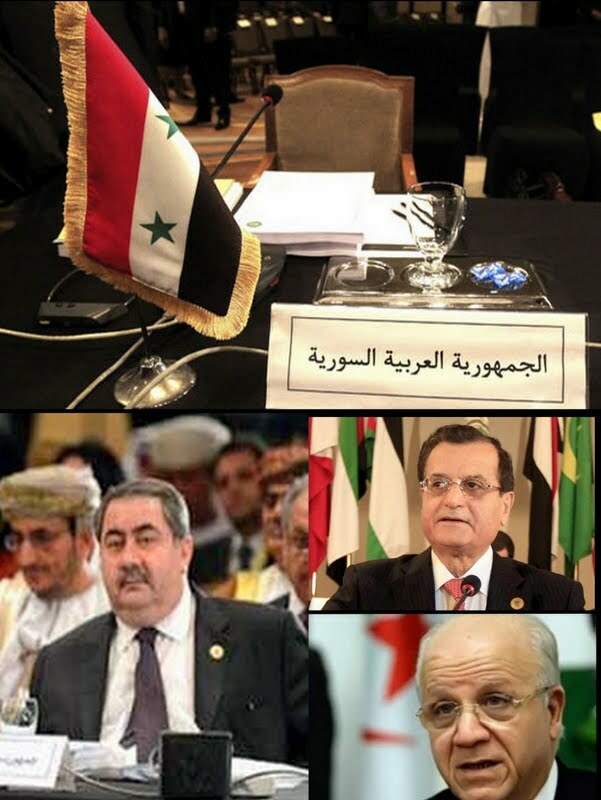 Syria’s own foreign ministry reacted by restating its "rejection of any role for the Arab League in a peaceful resolution of the crisis in Syria," accusing the League of being hostage to Qatar and Saudi Arabia and manipulated by the "monarchies of money, oil and gas." Lebanon’s al-Akhbar, which speaks for Assad and Hezbollah, said “العرب للسوريين: اقتتِلوا” -- i.e. the Arabs effectively tell Syrians to keep up their internecine warfare. Al-Akhbar commentator Hassan Olayk separately defends Adnan Mansour, who represents the Shiite Amal Movement in the Beirut government. Olayk says the Lebanese foreign minister simply called for peace in warmongering times championed by oil-rich kingdoms. The Arab League met in Cairo on the same day the UN refugee agency was saying the number of Syrians who have fled their war-ravaged country and are seeking assistance has now topped the one million mark. "With a million people in flight, millions more displaced internally, and thousands of people continuing to cross the border every day, Syria is spiraling toward full-scale disaster," the UN High Commissioner for Refugees, Antonio Guterres, said in Geneva. The Syria conflict is also depriving hundreds of thousands of children of their education. In Aleppo, children attendance rate has dropped to as low as 6 per cent. Syria healthcare system has also collapsed, according to medical charity Médecins Sans Frontières (MSF). MSF said in a report published today that hospitals, doctors and patients had come under direct attack, and many trained medical staff had fled abroad. One-third of public hospitals are no longer functioning and healthcare has been forced underground, MSF said in a summary by the BBC . The charity has more than 200 staff working in rebel-held areas of Syria. It said repeated requests to the government for wider access had not been granted. Despite its limited access, the charity said it had carried out more than 20,000 consultations and 1,560 surgical procedures since the start of the conflict in March 2011. It has also opened three hospitals in opposition-held northern regions. But MSF said the conflict had "made a mockery of the concept of healthcare". "Medical aid is being targeted, hospitals destroyed and medical personnel captured," said MSF's Dr Marie-Pierre Allie. The exodus of trained medical staff had left inexperienced workers trying to provide care, the charity said. "Dentists are performing minor surgeries, pharmacists are treating patients and young people are volunteering to work as nurses," the report said. Doctors had been labeled "enemies of the state" for treating the injured and both sides were now using hospitals as a war strategy, MSF said. While government air raids targeted medical facilities, the rebels had begun to label their facilities "Free Syrian Army hospitals", increasing the risk of attack. Increasingly, medical care has been forced underground, with makeshift hospitals set up in caves, homes and farms. But MSF says these facilities are still being targeted in air raids.